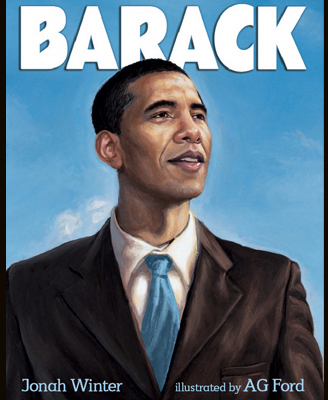 While surfing the net today, I discovered one more Barack Obama children’s book to add to my list, Barack, written by Jonah Winter and illustrated by AG Ford (read his blog). I haven’t read the book, yet (maybe they’ll send me a review copy), but the cover illustration is off the chain. Do they still say that? Anyway, it’s published by HarperCollins, September 2008.